CBA12 takes place in Lilongwe, Malawi from 11-14 June 2018. The event uses a new programme design to engage participants in open and fruitful dialogue on new knowledge and skills that help build the international CBA community of practice. Participants will engage in 10 minute rounds of introducing and hearing about innovations and learning that showcase lived experiences, tools and/or case-studies. This session gives participants the opportunity to present good-practice narratives based on their own experiences. Making “the pitch”What does it take to get funding and investment into CBA? A look at how to set out the case for funding of local-driven climate action. The workstream will cover ways to collate and analyse experiences of local climate adaptation and to generate and promote policy relevant evidence. Attendees will get the opportunity to explore new methods and to share learning on the topic. Key sessions include an introduction where we will identify key experiences; a session to explore the experience of using the ‘realist synthesis’ methodology in Ethiopia; discussion of how to reach and listen to grassroots women and others; and a session on ways to influence policy with evidence. This workstream will seek to build a shared understanding of devolved climate finance, drawing on learning from a range of experiences. We will view DCF approaches through three lenses – their approach to defining and using resilience, how they incorporate varied priorities of different and marginalised groups, and their approach to scaling upwards and outwards. The sessions will identify the trade-offs of different tools and institutional arrangements, spot the gaps in the “market” for DCF, and create a forum for suggesting improvements and addressing challenges. The second day of sessions will hone the narrative of each approach to develop effective pitches to targeted investors. Participants will come away with a deeper understanding of key principles of devolved climate finance, the tools that can be used, and how to pitch their own work more effectively. This workstream will seek to explore how ‘technology’ can be used to increase investment in and implementation of adaptation. It will build on the fact that, rightly or wrongly, ‘technology’ tends to grab the interest of policy-makers, the private sector, donors, even communities and households themselves. Given the very broad scope of ‘technology’, we will use 2 workshops (in series) to get participants to draw on their wide ranging experience and knowledge to look at: (1) Opportunities related to the management of (local) natural capital – soils, biodiversity (crop, livestock, trees, fish), water, land; and (2) Opportunities that come from new technological innovations – e.g. renewable energy, climate information systems (CIS), information and communication technologies (ICTs). In a third (concluding) workshop, we will review the various ideas and opportunities identified, and choose the most popular or compelling to develop pitches to targeted investors. 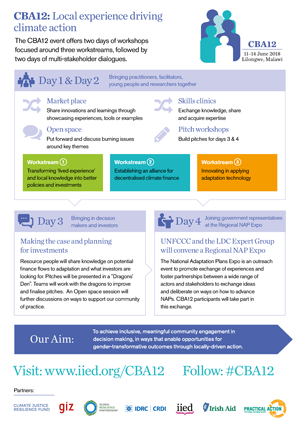 Participants will come away with ideas and narratives for how technology can be used to enable adaptation, and ‘hook’, excite or inspire private sector actors, policymakers, donors or others to invest in adaptation, … and how to pitch their own work more effectively. “Speed dating” session: participants have the opportunity to present good-practice narratives based on their own experiences. Small group work: teams from the workstreams to develop the pitches for funding that have emerged from the three workstreams. Participants have the opportunity to join parallel skills clinics to exchange knowledge and share expertise on topics such as monitoring and evaluation, accessing climate finance, developing proposals, communications. Everyone is invited to come ready to share their skills and learn from each other. The Talanoa is designed to facilitate a conversation in learning circles between practitioners of locally driven climate action, government, private sector, climate negotiators and grassroots women to inform gender transformative climate action. Constance Okollet a grassroots climate activist from Uganda. What examples can you share that illustrate how grassroots women’s representation in local, national and international decision making can support gender transformative climate action? What are the barriers to the meaningful participation of grassroots and indigenous women in delivering the Paris Agreement at local, national and international levels and how can we overcome them? Small teams of participants from workstreams 1, 2 & 3 will be invited to prepare and make ‘pitches’ (i.e. set out their case) for putting finance behind CBA examples to a panel of people with the expertise to advise on how to draw down investment from private and other sources.We will use the “dragons dens” format for this session whereby people with proposals for CBA initiatives try to convince a panel of would-be investors to support the proposals with financial resources and investment know-how. Teams will get feedback to help them improve and finalise their pitches. An open space session for the community of practitioners to debate ways to tackle shared challenges and opportunities, such as what combination of approaches will enable transformation, how insights into effective policy, adaptation technologies and investment approaches would work together. The UNFCCC and the LDC Expert Group have convened a Regional National Adaptation Plan (NAP) Expo for Thursday 14 June 2018. Methodological aspects for linking local to national – integrative framework for NAPs and SDGs – based around local climate risk assessment. Typical local adaptation strategies – how these were design and implemented. Trade-offs and synergies among local priorities – CBA vs EbA, etc. Lunch break -- Plus: optional breakout group for those wanting to know about the NAP guidelines and LEG’s NAP progress assessment. How can we map local initiatives and achieve integration and coherence of local and national? How to measure success and effectiveness of local adaptation? CBA12 takes place from 11-14 June 2018. Visit our online registration page on Eventbrite to register for your place.